"Phoebe was missing for five weeks and two days after accidentally hitching a ride to the local supermarket in our neighbours car and escaping into the car park. Phoebe is a beautiful Blue Burmese who is two years eight months old. She is a very loved member of our family and the five weeks and two days she was missing was very stressful, not knowing where she was, wondering if she had managed to find food and water, was she OK, would we ever see her again are thoughts that run through everyone's mind who has lost a loved pet. The thoughts, messages, support from people was really lovely, along with the suggestions and encouragement. We are very grateful to these people who cared. We received about four phone calls of sightings which we followed up but with no luck. 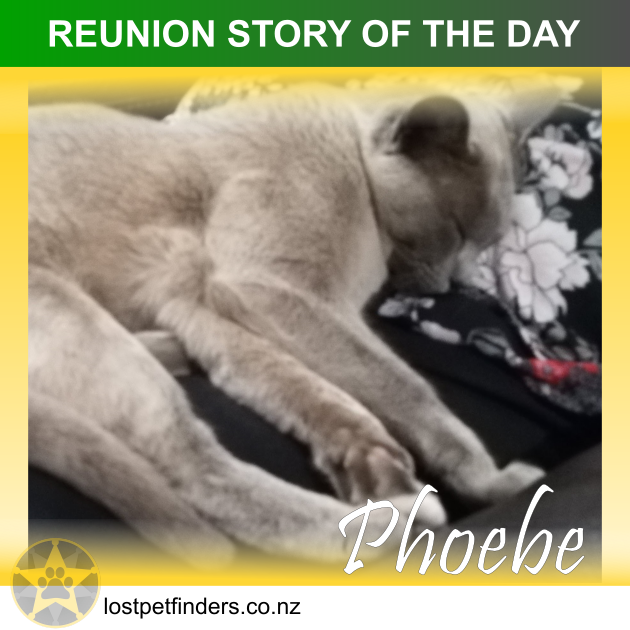 We put Phoebe on Lost Pet Websites, Facebook, delivered flyers, put posters in the supermarket, vets, SPCA Napier & Hawkes Bay and also an advertisement in the local free paper. Phoebe is micro-chipped so we just had to wait and pray that someone would find her and take her to the local vet or SPCA to be scanned. Phoebe was hanging around a ladies place lost, very skinny and very hungry. This lovely caring lady took the time to gain Phoebe's trust and was feeding and loving her. Phoebe is so loving the lady thought she must belong to someone so looked through the Hawke's Bay Lost Pets Website and found our listing. What an afternoon that was, I went around to the ladies place and sure enough there she was. I picked her up and cuddled her, she continuously smooched around my legs and flopped down for me to pat her like she always does, it was wonderful. What was also wonderful was all the supporters from the Lost Pets websites, Facebook etc. that were very happy and relieved that we had found our girl. Attached is a photo of Phoebe asleep on my lap, her first night back home.